Interfaith Community Solidarity Shabbat at Temple Emmanuel of Wakefield. Friday, November 2 at 7 pm. Last Shabbat, we witnessed the deadliest act of anti-Semitism in North American history — the attack at the Tree of Life Synagogue in Pittsburgh. 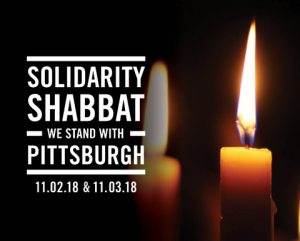 This Friday and Saturday, November 2-3, the Greater Boston Jewish community is joining with federations and partner organizations across the continent for a Solidarity Shabbat supporting the Jewish community of Pittsburgh. Our hearts are broken by this terrible tragedy, but we will stand together as a community in this show of resilience, remembrance, and love. Rabbi Greg Hersh and members of Temple Emmanuel of Wakefield will hold our Solidarity Shabbat this Friday evening, November 2 at 7 pm. Wakefield Police Chief Richard Smith and other speakers includieTown Administrator Steve Maio, Wakefield Superintendent of Schools Lyons, Rep. Paul Brodeur, and a representative from the Wakefield Human Rights Commission. Expected to be present other Wakefield Town Councilors and Wakefield Clergy. Temple Emmanuel is a member of the Jewish Reconstructionist Communities. 120 Chestnut Street, Wakefield, MA 01880 781-245-1886, info@WakefieldTemple.org.